Direct Automation's 24 VDC powered SOLO process/temperature controllers are powerful process tools offering flexibility and simplicity. Available in four standard DIN sizes, these single-loop units are equipped with a dual four-digit, seven-segment display, and offer dual output control, making them ideal for managing heating and cooling processes.Â The built-in autotune function with PID control feature allows for fast and easy startups. 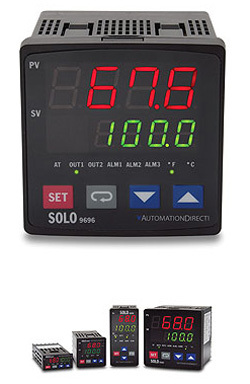 Flexible control modes include PID, Ramp/Soak, ON/OFF and Manual operation. AutomationDirect’s SOLOTM digital temperature controller is a single loop dual output temperature limit controller that can control both heating and cooling simultaneously.